I can't help but always be grateful when Friday rolls around, and today is no different, despite me having to work o Saturday. My brother is flying into town for the weekend and he'll be spending some fun time with LO. He's a great father and I'm always happy to have him around now that I have LO. We'll probably be eating lots of good food this weekend too, which the thought will help bring a spring in my step after an otherwise stressful work week. 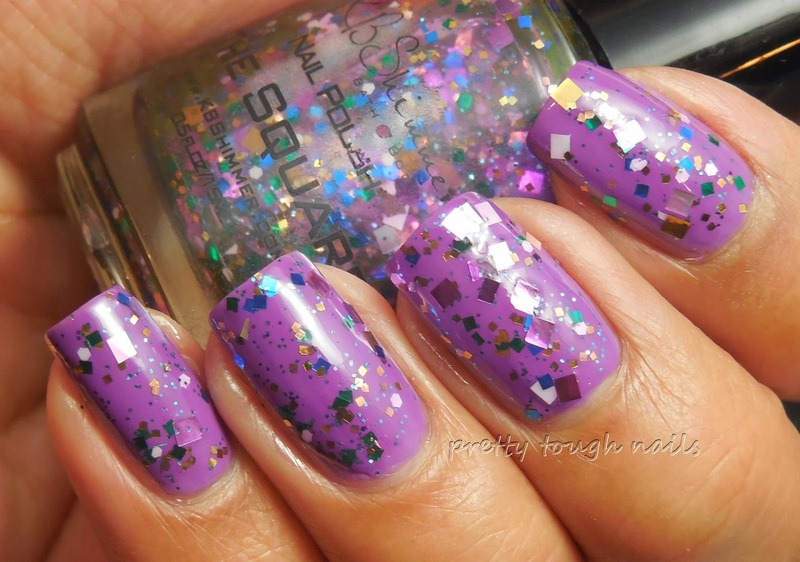 To help bring some sparkle into my life, I started with a nice calming lavender cream purple by way of Zoya Malia. This applied like butter onto my nails and I had no streaking upon application. I used two easy coats here with no topcoat. Next I used the dab and smooth technique to apply a coat and half of KBShimmer The Square. This appeared to have a slightly tinted purple base, so I thought Malia would be a good match. I'm not entirely sure if it's suppose to be tinted purple or if some of the purple glitters bled... I'll have to research that some more. The Square, true to its name, has a multitude of large and small metallic square glitters in a rainbow of colors. I finished with a layer of my Poshe/GCS mix topcoat. 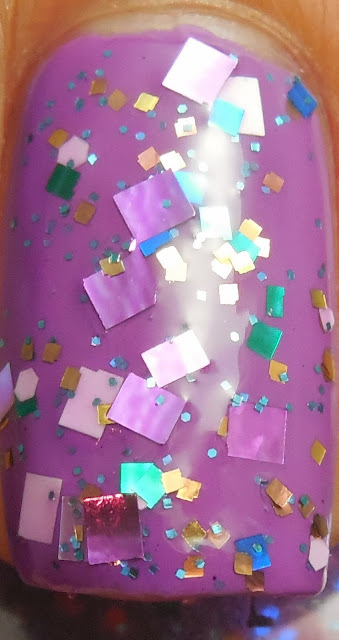 With the flooding of indies onto the market and the abundance of glitter toppers, I'm happy to find a unique take on it with the square glitters in this topcoat. My favorites are the white and gold squares - hmm... anyone want to do a white and gold square glitter topcoat? It seems like the possibilities are endless! KBShimmer released a ginormous collection recently, and I'm super impressed with the creativity behind all the polishes that were created. Will you be picking any of them up? Supercute! Such a pretty combo, I'm loving this light purple look on you! Thanks! I thought it washed me out a little, but looking at the pics, it actually looks ok! I love this combo! The glitter is super pretty. I want so many of the new KBShimmer polishes. They're all so gorgeous. They are... so hard to resist!! I might wait until Black Friday to see if she has a special sale to pick some up.